A while ago I discussed the Weibull Distribution and its importance in electronics reliability analysis. This distribution has been used to evaluate the life of solder joints whether formed in SMT, wave, or even using solder preforms. In the next few posts, I would like to discuss how to interpret Weibull plots. Let’s consider two Weibull plots from thermal cycle testing of lead-free solder joints as seen below in Figure 1. Figure 1. A Weibull Plot of Thermal Cycle Data for Alloy 2 and Alloy 4. Both alloys have almost exactly the same scale, or characteristic life. You will remember that characteristic life is the number of cycles at which 63% of the test subjects fail. For Alloy 2 it is 2,593 cycles and for Alloy 4 it is slightly better at 2,629 cycles. However, these two alloys performed dramatically differently. The most striking difference is in their “spread.” We see this much greater spread for Alloy 4, when we plot a fit to the data as a normal distribution, as in Figure 2 below. Figure 2. 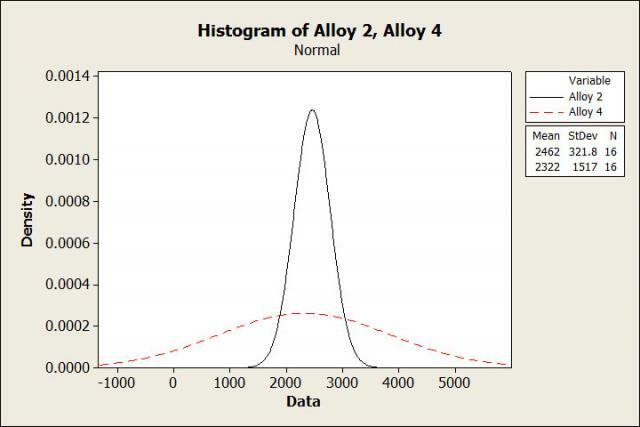 The Best Fit Normal Distribution Plot for Alloy 2 and Alloy 4. 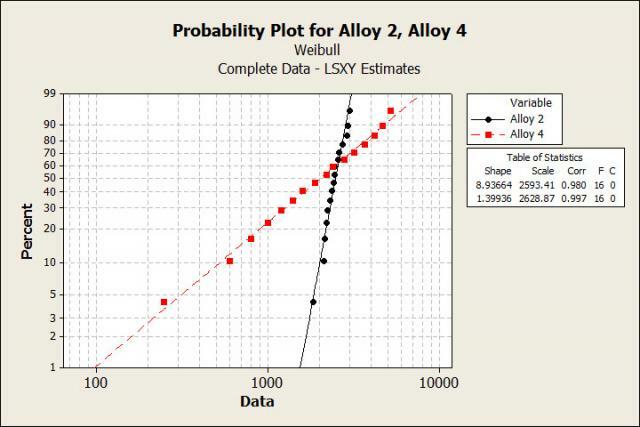 In the Weibull plot, the data for Alloy 2 has a very steep slope or shape factor, this indicates a tight distribution. A tight distribution is desirable as it facilitates more accurate prediction of thermal cycle life. Alloy 2 is clearly superior. So, in a Weibull distribution, not only is a large scale factor or characteristic life desired, but so is a steep slope or larger shape factor. Next time we will talk about outliers.